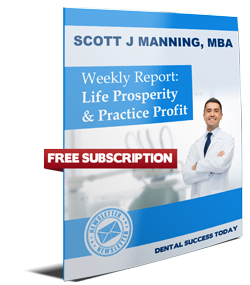 Subscribe now and receive Scott Manning's Life Prosperity & Practice Profit Weekly Report. Join thousands of dentists who receive Scott's weekly insights and explore the inner workings of your dental practice. This has been the very catalyst for North American Dentists to begin creating their own Dream Lifestyle Practice and liberating them from daily grind they once endured. Now it's your turn to take part in this extraordinary journey that has led to a dramatic shift in the dental industry and beyond. Get Your Copy of Scott's New Book Today ... FREE! To many Dentists, it seems like the war against BIG Insurance is over. It’s the age of Wal-Mart and the commoditization of dental care has become an unstoppable locomotive – steamrolling over the dreams of independent practices across North America. So why fight it? Why not submit, give in, give up? Don’t fall prey to the dispensers of doom, gloom, and misery. Even in today’s chaotic health care marketplace, open-minded and resourceful Dentists CAN forge a new path through the wilderness. A path that leads to freedom from corporate control, cookie-cutter procedures, and low ball compensation. WARNING: Take heed and prepare yourself - it’s going to be intense. Scott didn’t pull any punches inside this revolutionary new book. You’ll be shocked, challenged, and almost certainly made more than just a little uncomfortable… because you will need to buckle down and put what he reveals about this SECRET into hard, serious ACTION. So, if you’re ready to move beyond yet another “book of rehashed advice” for something raw, real, and powerfully transformative – then “The Dental Success Secret To Having a Vibrant Practice That Thrives and Grows Year After Year After Year” is the one book you need no matter where your practice is today. 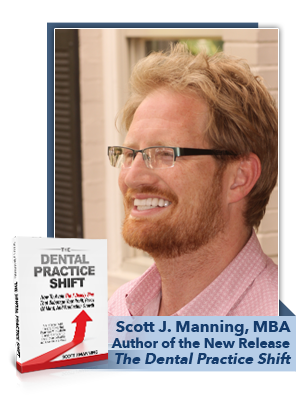 Read the latest from the Dental Success Today experts including Scott Manning. Watch the unforgettable real life stories of practice transformation. Read more about the founder of Dental Success Today. "“Scott offers a wonderful outside view… It is very very much a ‘Let’s define what you want your practice to be and then figure out a way to make it a viable economic business and a viable personal business so that you go home energized rather than worn out.’ Through Scott, you defined what you want your practice to be and I find that much more rewarding than when I was chasing someone else’s dream.”"
"I think one of the things that I've been thinking about since meeting with Scott is that as dentists, we’re professionals. We’re highly trained. We’re highly skilled. We’re professional, but so is the third baseman for the Toledo Mud Hens. He’s a professional. So the question is, what league do you want to play in? Do you want to be a minor league professional or do you want to play for the Yankees? What vision do you have for yourself? Do you see yourself as a utility infielder on a Class A team or are you going to strive to make the majors? That’s what we’re doing with Scott." Let Scott Manning’s Experience Serve You. 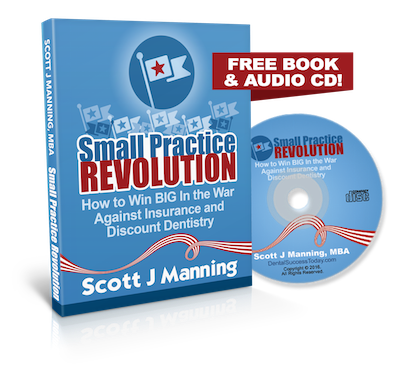 Attention Dentists Looking for MORE from Your Practice... You have found the direct source for the proven strategies and highly regarded information that will alter your practice (and more importantly, your LIFE) in the most dramatic fashion, IF you take action now. For a limited time, International Consultant, Scott J Manning MBA, is offering a complimentary Custom Profit Blueprint to review your current patient production and the effectiveness of your patient acquisition strategies. In addition, you will also receive his Practice Prosperity Package, which is jam-packed with uncommon wealth-building strategies. 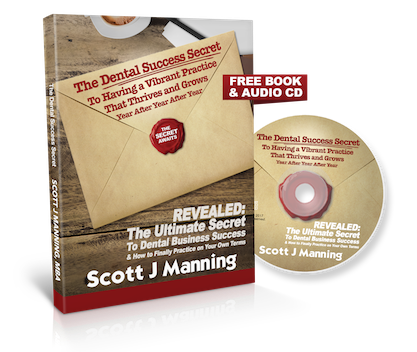 The combination of Scott's Confidential Reports, DVD Presentation, and Audio CD will unlock real prosperity for you and your practice, guaranteed.